Yesterday John, Ryan and I spent a fun few hours walking through Seattle Center, peering up at the Space Needle and meeting family for a play at the Seattle Children’s Theater. I took plenty of interesting reflecting photos with this challenge in mind and even though you’ll still get a chance to see a few of them over the next week I found my final image at the end of the day in a different part of town. We arrived a few minutes early for our dinner reservations at Tulio and John was nice enough to excuse me while I ran across the street to take as many pictures of the Seattle Public Library as I could before the sun set across Elliot Bay. Posted as part of the Weekly Photo Challenge: Reflections. Great photo of wonderful reflections in the angles. Fantastic! Was this with your phone or a camera, Lisa? I took it with my phone – It’s always in my pocket and ready for quick shots! Also, I ordered a Moscow Mule before dinner thinking it would be fun to take a photo but they did’t serve it in a fancy copper cup. 😦 It was tasty but not pretty enough for a picture… I’ll have to try again when we get together! We’ll have to source a joint that serves them more authentically when I make it out your way. ***Or — come to Toronto! There are a couple of very cool bars here, including one Russian-inspired one, where I’m sure we can get the real deal. I know, I was so surprised to see it in a regular clear glass. 😦 A trip to Toronto would sure be fun! If I ever have plans out your way I’ll definitely let you know! That’s just a really cool shot. 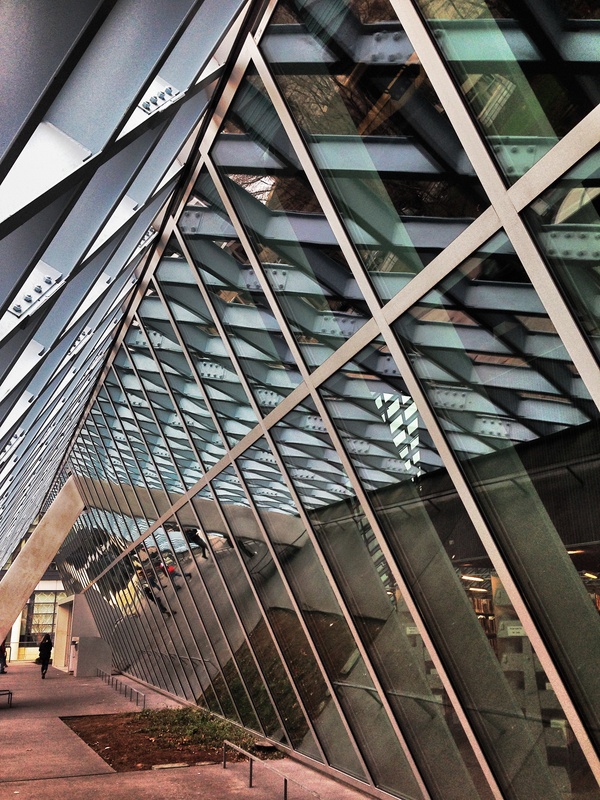 I’ve been in the Seattle Public Library. Loved it! Great to know! It is an unusual building but with lots of interesting photo opportunities and wonderful light! Great photo and looks like it was fun to be there taking it. I love the library building! What a perfect reflection capture, Lisa! Thanks Amy, I’m happy we decided to have dinner across the street! Great photo! The reflections, lines and composition are fantastic! The library is one of those buildings where you can get some great, disorienting reflective shots. Love finding those! Yes, this is a great place to find some unusual angles and light! Let me just say that I was very confused at first. 🙂 Really cool image! What a nice design. The glass makes the area look much larger. Thanks LD. It is a popular place to take photos! Great job!! I’ve tried to capture this same image with no luck! It just didn’t turn out the way I pictured in my mind! Wonderful job, great angles and design! now this is so cool – there are reflections with in the reflections – like I saw the windows had additional things – this is like reflection madness. 🙂 love it. Thank you, I’m happy to hear you like it! Wow , this is an amazing picture! Lots of excellent lines and angles, Lisa. Brilliant shot, Lisa! 🙂 I love it. What is it about the reader? so often I miss peoples’ posts! Argh… Luckily I have you sent to my inbox ;). This is a terrific shot of an amazing subject. The flash of red coat in the reflection makes the shot! Great shot in so many ways! Love the many angles! Great photo, I really like the lines in this. what a fantastic click. i say that understanding family and friends are golden! Beautiful reflection shot. The Seattle Library – made famous by Nancy Pearl – at least that’s what comes to mind. The architecture of the central library is really interesting.